Thinking about looking at a Caille Superuor 25 cent machine but they say it shorts you on payout. How do I tell if this was an English 1d export that's now back in the goos old USA? Award card looks old but that doesnt necessarily mean anything. Its on ebay if anybody wants pictures. It does have some issues. if it's a a 25 cent machine ,then it wouldn't be an Ex- British machine. 1d coin = 50 cent coin. a 6d coin = a 1 penny sized coin (roughly). some use nickles to play a 6d coin slot also ,resulting in jam ups ,ect. heard a few use dimes but, the wins would be bigger at times, plus possible jam ups in the pay out slides. if this was a conversion from a non- U.S. used machine , maybe french. believe they have a coin similar in size to a 25 cent piece. what does the pay out state on the award card ?? some times this helps. other than that , could be just a basic issue of not being clean , bad springs , ect. ask the seller if they are sure it takes a 25 cent coin, not slightly bigger sized coin (check coin entry hole). what's the item number for it ?? I dont have the listing number but you did answer the question about it possibly being british. So it sounds like the 50c ones are the ones to watch out for. If I recall correctly, the jackpot paid out up to 21 quarters I think plus the actual jackpot. yes , many 50 cent machines did have a previous life as a 1d British used machine. some you can tell if it was for export only (slight difference in the castings, ect.) , other you can't. but,many were reworked using actually 50 cent slides, so you wouldn't know the difference. I currently own 2 1d machines, 1 still takes those coins, other take the U.S. coins. I'm not familiar with Caille machines, did they make any that had deviations in the pay outs ? I believe Jennings did (?) a pay out scale like this ?? Picked it ip today and the payout scale is 19-21 ,15-17, 15-17, 11-13, 11-13, 7-9 ,7-9 ,4,4 and 2. Machine has a 17xxx serial number. I do have a question about the jackpot fill. It isnt working and I think I'm missing a spring. I took a picture and pointed to where I believe one end of the spring hooks but where does the other end go? All my Caille literature shows later (i believe) superiors and doesnt show this part. Nobody can help on where the spring goes? I did find a picture on the net but cannot blow it up enough to clearly see. Is mine an early machine being serial number 17xxx? 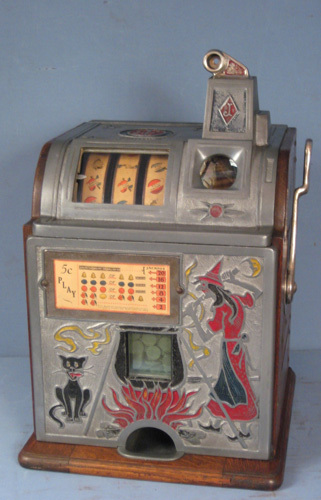 Thanks Herb......you are right I believe.This machine appears to be a Naked Lady converted to a superior front with jackpot.Anybody else have one? Got the machine working again after welding the top slide. Only thing left to do is to get the right size spring for the jackpot lever fill and then the jackpot will fill after a payout. Here is a picture of the kit. Just joined today.... did you resolve the issue with the spring? Yes..I got it working. I made a piece to go in there as well so that its basically fixed and moves in unison.